I want to buy it but I don't want to pay 1200MSP for it so i'll do what I always do and wait for it's inevitable DOTW appearance in 6 months or so. As detailed in Major Nelson's chart rundown, Gotham City Impostors is showing impressive legs at two, followed by perennial seller Pinball FX2. Rayman 3 HD is the highest new entry at four followed by critically lauded shoot 'em up Sine Mora at five. 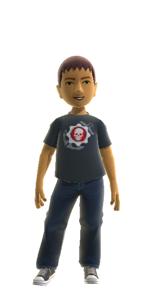 Nelson also published the weekly Xbox Live activity chart, but there are few surprises there. Modern Warfare 3 still rules all, followed by Black Ops, FIFA 12, Battlefield 3 and Halo Reach. The only game released this year to feature in the top 10 is Mass Effect 3 at 7. The only new entry in the top 20 is Resident Evil: Operation Raccoon City at 14. ... Hopefully they'll have enough support to release a 2nd, because as I say - it has huge potential to be something more than it is. Agreed. Even if their 1st attempt is a flop, new ideas need to be encouraged. I'll be buying this. Yeah I got it a few months ago for 400 or 600 points, can't remember, cheers for the heads up though.